Automotive Engineering gets a BIG Boost! Looking to the Past to find Solutions for the Future: A Trolley Bus for the 21st Century. Report on the 2002 Institute of Road Transport Engineers New Zealand Convention - Safety Pays. Review Paper: Biomechanics of Driving: Stimulus, Response and Fatigue Issues by Ir Iain Seymour-Hart. 'New Event' Seminar at AE/LWL by Young Members Section of I.Mech.E of Hong Kong. 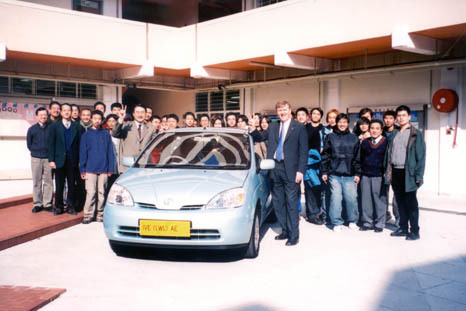 A new Toyota Prius "Hybryd" car was delivered to the Automotive Engineering Department of the Hong Kong Institute of Vocational Education (Lee Wai Lee) on 16th January 2002. Professor Francis Kwok, Principal of the 'Lee Wai Lee' campus, full-time students and staff were most excited about the prospect of having the latest technology to greatly enrich the quality of the 'teaching and learning' experiences, for all concerned. The Hong Kong SAR Government have provided a special fund of HK$2.6 million, called the "Air Quality Related Equipment Fund" in response to an application made by Head of Department, Ir Iain Seymour-Hart to update KEY equipment areas. It seems that the Government has agreed that there is a need to upgrade the facilities of the Automotive Engineering department in order that students may be better educated to appreciate the part played by new technology in improving our environment, not least our local air quality. The aforementioned fund will enable the AE department to purchase about ten items of equipment which will greatly advantage all students studying Automotive Engineering courses, particularly those engaged on the new Higher Diploma in Automotive Engineering. The Toyota Prius is designed to conserve resources and protect the environment. This earth-friendly vehicle is claimed by Toyota to be the first mass-produced hybrid automobile. 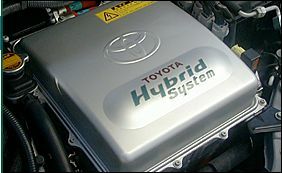 The Toyota Hybrid system is an automotive power-train that uses both gasoline and electric motive power. It has a 1.5litre Variable Valve Timing – injection engine which provides power to the generator and moves the vehicle. A 3-phase electric motor also provides power to move the vehicle. When decelerating or braking, the electric motor acts as a generator, transforming the kinetic energy of the wheels into electric storage in the HV’s Nickel-Metal-Hydride (Ni-MH cell) battery. An advanced computer controlled system monitors and controls the operation of the major components to always have the system in the most efficient condition. Like conventional cars the Prius runs on regular gasoline. The battery unit never needs to be recharged from an outside source. The use of an electronically controlled, continually variable transmission (CVT) ensures a smooth quite ride. 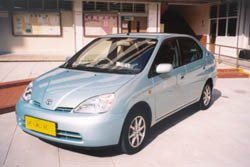 Under the EC Mode Combined, the fuel economy of Prius is 20kilometers per litre. In European Emissions Regulations test, The Prius reduced its HC (Hydro-carbon), CO (Carbon-monoxide), and NOx (Nitric-oxides) emission by almost 50% well under Euro IV emission levels (homologation data). More news regarding other items of equipment to be acquired and lots of new initiatives from the AE team will be forthcoming in due course. For more details of our courses and / or facilities please contact Ir Iain Seymour-Hart [direct line 2339 9753] or one of the AE staff [call 2338 3611]. Academic and support staff of the Department of Automotive Engineering of the Hong Kong Institute of Vocational Education (Lee Wai Lee) went to see the Trolley Bus Project recently developed by Citybus Ltd. The visit took place during the morning of the 19th January 2002 at 10:00am and turned out to be a most friendly and informative event. Ir John Blay, Consultant Engineer for Citybus Ltd, warmly greeted the 20-odd visiting team, led by Head of Department, Ir Iain Seymour-Hart. 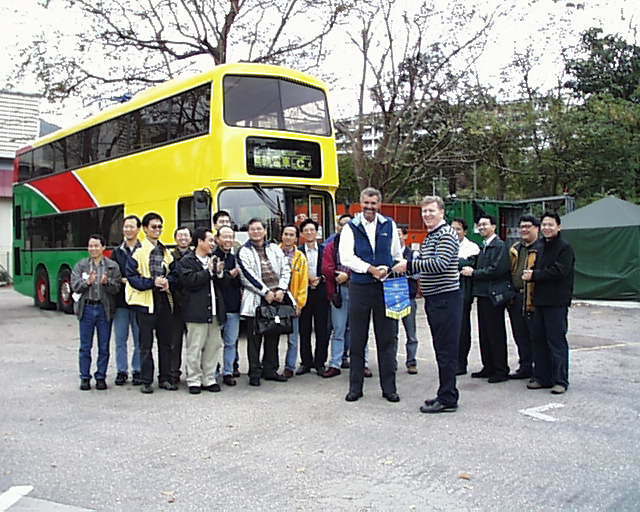 The trolley bus project site was located along Ocean Park Road next to the Hong Kong School of Motoring and near to Ocean Park, Aberdeen, Hong Kong Island. Many beautiful mature trees surrounded the site, exemplifying the 'environmentally friendly' nature of the trolley bus. 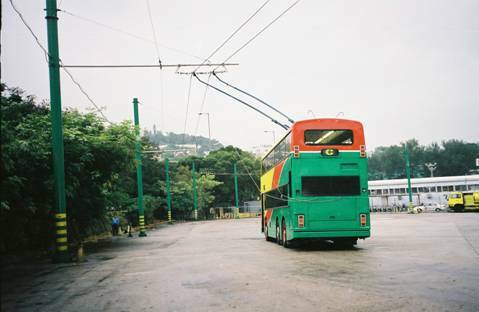 The development of this super-modern version of a trolley bus was in response to concerns regarding the degree of noise created and amount of tail pipe emissions emitted by conventional diesel buses, especially in the urban areas. A further consideration being that in a few years time diesel fuel is likely to increase in price as demand grows and supplies dwindle. 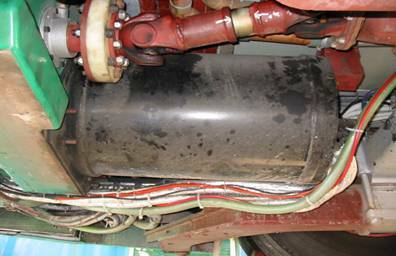 Furthermore, Citybus operate about 1,100 diesel buses which all need regular oil changes, replacement of filters and brake facings thus creating a large amount of waste product which must be disposed of locally. In comparison, a trolley bus requires much less maintenance and produces very little waste product compared to its diesel counterpart. On the other hand, a trolley bus system would need the installation of an infrastructure of poles and cables to supply electrical energy along the routes it would ply. At the project site, twin overhead cables, supported by a series of vertical poles, had been erected to form a large semi-circle covering about half of the perimeter of the enclosure. However, the cables and poles were not so noticeable in the presence of the tree indicating how such a system could easily blend into a natural environment. It was easy to appreciate how pedestrians would be able to enjoy fresh air and a much quieter environment, right in the heart of the city, if trolley buses were to replace diesel buses. If used in and around housing estates, trolley buses would create much less disturbance especially late at night. When the visitors first spotted the trolley bus, they were impressed with its ultra-modern, colourful appearance and the clever design of the driver's cab controls which were just the same as the ones found in existing diesel buses. The trolley bus had been installed with air conditioning, a compressed air braking system and had two passenger decks. 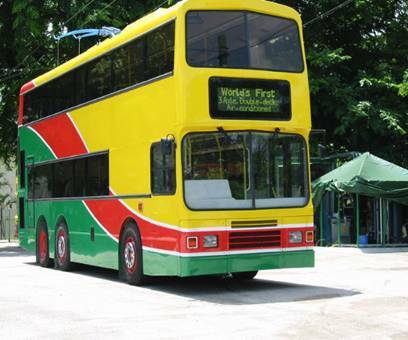 It could easily be mistaken for a conventional double decker bus, except for the two booms on its roof and was probably the only double deck, air conditioned olley bus itrn the world. A real 'first' for Hong Kong! John Blay described the operating principle of the trolley bus to the visitors. Basically, the power supply system is 380volts, 3-Phase, which is transformed to 485volts, 3-Phase and then rectified, by solid state silicon rectifier modules, to 600volts DC, the whole system having a capacity of 500KW. This power is connected to the two overhead power lines to supply the needs of the trolley buses anywhere along the system. Trolley buses slowing down, being retarded or going down hill would generate electricity and supply this back to the power lines for either (i) use by other trolley buses or (ii) to be stored in a flywheel for later use. 1. The traction inverter and AC motor for driving the vehicle. These are manufactured by Ansaldo of Genoa, Italy and are water cooled. 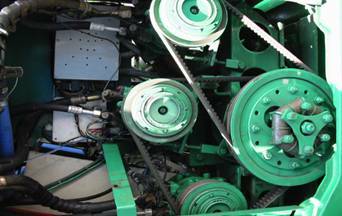 The motor has a normal maximum power of 180KW and a peak output of 230KW. External feeds are arranged to the inverter from (i) the accelerator pedal, (ii) the forward / reverse selector, and (iii) the brake pedal, in order to determine power demand, direction of travel (forwards or backwards) and brake regeneration. 2. The air conditioning Inverter and AC motor. These are also manufactured by Ansaldo and are again water cooled. 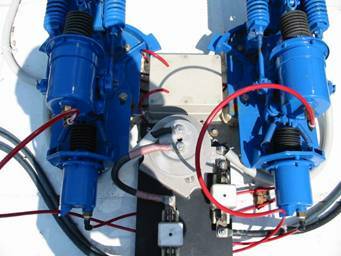 The motor has a maximum output of 100KW although only about 50KW, maximum is required. 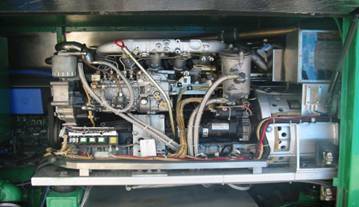 This motor drives three air conditioning compressors and one alternator (24volts DC) using normal vee-belts. 3. The air compressor, manufactured by Atlas Copco. These are of the 'Scroll' type driven by a 4 KW motor, manufactured by Brook Hansen. Both are both air cooled. 4. The power steering pump. This is driven by a 7.5KW motor, manufactured by Brook Hansen. 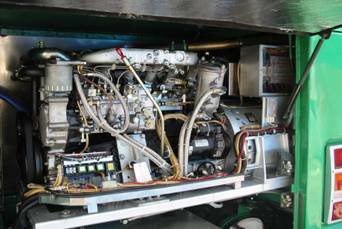 In addition, there is a Fischer Panda (Germany) diesel generator providing a nominal 100KW of power, at 600volts DC, for offline operation and depot mobility. The boom bases are fitted with an electro-pneumatic system to enable the driver to lower or raise the booms from the driver’s seat. An electrically (24volt DC) driven fan is used to cool the radiators for the Ansaldo equipment, and also for the diesel generator. The traction motor drives through a constant ratio reduction gearbox to the standard rear axle which is the sole means of driving the rear wheels of the trolley bus. 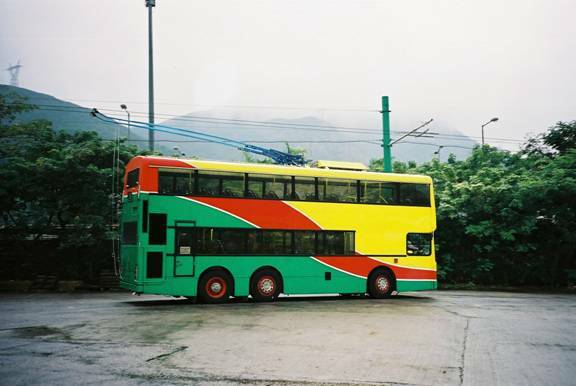 The bus is a converted 10.6 Dennis Dragon, manufactured in 1993, with a Duple Metsec body assembled by Caetano of Portugal. 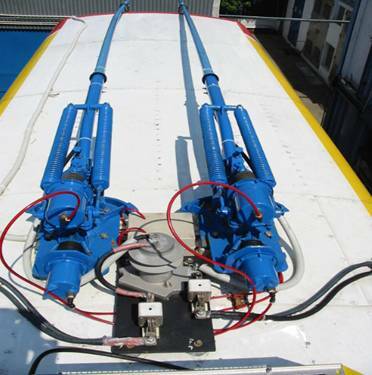 The roof structure had to be strengthened to take the extra load from the boom equipment and the brake resistors. As much as possible of the original bus had been retained. The overhead booms can be lowered or raised by the driver, without him leaving the comfort of his seat. This would be done when the bus was being moved in and around the bus depot where there would be no need for overhead wires. In addition, in case of a power failure the trolley bus driver could simply lower the booms and drive the bus using the electrical power generated by his on-board, diesel powered generator set. The trolleybus has been found to out perform the diesel powered equivalent, whilst being quieter, and non-polluting. This was evident when members of the visiting team were given the opportunity to drive the trolley bus. Team member, Dr. Sydney Ho, an avid trolley bus fan, test drove the trolley bus and found the maneuverability and acceleration quite startling. He found that the trolley bus could even overtake parked vehicles or other buses stopped at bus stops and move from the any one of the lanes of a 3-lane carriageway. Whilst operating, he found that it was smooth and quiet and considered it a must for future 'clean and quiet' travel in and about Hong Kong. One team member made the point that when fuels become more difficult to locate and likely much more expensive the trolley bus will become more cost effective. In addition, it's quite and smooth operation would make it very soothing for its passengers on their way to and from work. After everyone had been offered the chance to drive the trolley bus is was decided to bring to an end this truly exciting visit. John Blay was presented with a souvenir and a banner, by Iain Seymour-Hart, and warmly thanked for giving up his valuable time to demonstrate this quite unique trolley bus. In reply to a request to bring along AE students, John welcomed such visits so that this wonderful idea can be exposed to the next generation of Automotive Engineers.